The condition usually has an onset of between the ages of one and 20 but can occasionally present in middle age. The condition is also known as Lewandowsky–Lutz dysplasia, named after the physicians who first documented it, Felix Lewandowsky and Wilhelm Lutz. Clinical diagnostic features are lifelong eruptions of pityriasis versicolor-like macules, flat wart-like papules, one to many cutaneous horn-like lesions, and development of cutaneous carcinomas. Patients present with flat, slightly scaly, red-brown macules on the face, neck, and body, recurring especially around the penial area, or verruca-like papillomatous lesions, seborrheic keratosis-like lesions, and pinkish-red plane papules on the hands, upper and lower extremities, and face. The initial form of EV presents with only flat, wart-like lesions over the body, whereas the malignant form shows a higher rate of polymorphic skin lesions and development of multiple cutaneous tumors. Generally, cutaneous lesions are spread over the body, but some cases have only a few lesions which are limited to one extremity. The cause of the condition is an inactivating PH mutation in either the EVER1 or EVER2 genes, which are located adjacent to one another on chromosome 17. These genes play a role in regulating the distribution of zinc in the cell nuclei. Zinc is a necessary cofactor for many viral proteins, and the activity of EVER1/EVER2 complex appears to restrict the access of viral proteins to cellular zinc stores, limiting their growth. Other genes have also rarely been associated with this condition. These include the ras homolog gene family member H.
No curative treatment against EV has been found yet. Several treatments have been suggested, and acitretin 0.5–1 mg/day for 6 months' duration is the most effective treatment owing to antiproliferative and differentiation-inducing effects. Interferons can also be used effectively together with retinoids. Cimetidine was reported to be effective because of its depressing mitogen-induced lymphocyte proliferation and regulatory T cell activity features. A report by Oliveira et al. showed that cimetidine was ineffective. Hayashi et al. applied topical calcipotriol to a patient with a successful result. As mentioned, various treatment methods are offered against EV; however, most importantly, education of the patient, early diagnosis, and excision of the tumoral lesions take preference to prevent the development of cutaneous tumors. In March 2007, a Romanian man named Ion Toader was diagnosed with this condition. A patient of dermatologist Carmen Madeleine Curea, his pictures appeared on numerous blogs and Romanian press sources. Curea works with Spitalul Clinic Colentina in Bucharest, Romania. Stephen Stone, past president of the American Academy of Dermatology, confirms this is Lewandowsky–Lutz. Toader underwent surgery in late 2013, and since then has been mostly symptom-free, with only small reappearances. In November 2007, a video of a 34-year-old Indonesian man named Dede Koswara with a similar disease appeared on the Internet. His story appeared on the U.S. Discovery Channel and TLC series My Shocking Story (Extraordinary People on UK's Five) in the episode "Half Man Half Tree". On August 12, 2008, Koswara's story was the subject of an ABC's Medical Mystery episode entitled "Tree Man". In all, 96% of the warts were removed. The surgery was documented by the Discovery Channel and TLC in the episode "Treeman: Search for the Cure". However, his warts returned and he was thought to require two surgeries per year for the rest of his life in order to manage the warts. The Discovery Channel funded a blood analysis and found he lacked an immune system antigen to fight yeast infection. He was offered to have more tests run to determine whether it is treatable, and the doctor was fairly optimistic, but he refused the treatment. According to The Jakarta Post, Koswara underwent the first of a series of new surgical procedures to remove the regrown warts in the spring of 2011. Surgery had, however, proven to be a temporary solution for Koswara, as the warts continued to re-emerge. He had thus undergone three surgical operations since his major surgery in 2008. At the end of December 2010, two doctors from the Japanese Society for Complementary and Alternative Medicine brought him a drug made from Job's tears. The medicine was still undergoing lab tests as of 2016. Aged 42, Koswara died on 30 January 2016, around 03:30 Western Indonesia Time, at Hasan Sadikin Hospital, Bandung, from the complications related to his condition. In 2009, the Discovery Channel episode "Treeman Meets Treeman" reported on another Indonesian man, from the same region as Koswara, who also has the disease and was given a similar treatment for it. His treatment seemed to have worked better. In 2013, one case of Epidermodysplasia verruciformis was reported in Iraq. No treatment was given since the condition was initially misdiagnosed. In January 2017 it was reported that a 10-year-old girl in Bangladesh, Sahana Khatun, was diagnosed after developing lesions four months earlier. BBC News said that the case may have been the first diagnosis in a female. In August 2017 it was reported that a 42-year-old man from Gaza, Mohammed Taluli, had been successfully operated on at the Hadassah Medical Centre in Jerusalem. In October 2018, a five-year-old girl in Honduras, Cristhél Suyapa Martínez, was diagnosed with the condition. ^ a b Ramoz N, Rueda LA, Bouadjar B, Montoya LS, Orth G, Favre M (December 2002). "Mutations in two adjacent novel genes are associated with epidermodysplasia verruciformis". Nature Genetics. 32 (4): 579–81. doi:10.1038/ng1044. PMID 12426567. ^ Lazarczyk M, Pons C, Mendoza JA, Cassonnet P, Jacob Y, Favre M (January 2008). "Regulation of cellular zinc balance as a potential mechanism of EVER-mediated protection against pathogenesis by cutaneous oncogenic human papillomaviruses". The Journal of Experimental Medicine. 205 (1): 35–42. doi:10.1084/jem.20071311. PMC 2234378. PMID 18158319. ^ a b Orth G (1986). "Epidermodysplasia verruciformis: a model for understanding the oncogenicity of human papillomaviruses". Ciba Foundation Symposium. 120: 157–74. PMID 3013521. ^ Antonsson A, Forslund O, Ekberg H, Sterner G, Hansson BG (December 2000). "The ubiquity and impressive genomic diversity of human skin papillomaviruses suggest a commensalic nature of these viruses". Journal of Virology. 74 (24): 11636–41. doi:10.1128/JVI.74.24.11636-11641.2000. PMC 112445. PMID 11090162. ^ a b Gül U, Kiliç A, Gönül M, Cakmak SK, Bayis SS (October 2007). "Clinical aspects of epidermodysplasia verruciformis and review of the literature". International Journal of Dermatology. 46 (10): 1069–72. doi:10.1111/j.1365-4632.2006.03014.x. PMID 17910717. ^ Lewandowsky–Lutz dysplasia: Who Named It? ^ Lowy DR, Androphy EJ (2003). "Warts". In Freedberg IM, Eisen AZ, Wolff K, et al. (eds.). Fitzpatrick's Dermatology in General Medicine (6th ed.). New York City: McGraw-Hill. pp. 2119–2131. ISBN 978-0-07-138076-8. ^ Pereira de Oliveira WR, Carrasco S, Neto CF, Rady P, Tyring SK (March 2003). "Nonspecific cell-mediated immunity in patients with epidermodysplasia verruciformis HPV". The Journal of Dermatology. 30 (3): 203–9. doi:10.1111/j.1346-8138.2003.tb00372.x. PMID 12692356. Archived from the original on 2010-02-04. ^ Lazarczyk M, Favre M (December 2008). "Role of Zn2+ ions in host-virus interactions". Journal of Virology. 82 (23): 11486–94. doi:10.1128/JVI.01314-08. PMC 2583646. PMID 18787005. ^ Crequer, Amandine; Troeger, Anja; Patin, Etienne; Ma, Cindy; Picard, Capucine; Pedergnana, Vincent; Fieschi, Claire; Lim, Annick; Abhyankar, Avinash; Gineau, Laure; Mueller-Fleckenstein, Ingrid; Schmidt, Monika; Taieb, Alain; Krueger, James; Abel, Laurent; Tangye, Stuart; Orth, Gérard; Williams, David; Casanova, Jean-Laurent; Jouanguy, Emmanuelle (2012-08-01). "Human RHOH deficiency causes T cell defects and susceptibility to EV-HPV infections". The Journal of Clinical Investigation. 122 (9): 3239–3247. doi:10.1172/JCI62949. PMC 3428089. PMID 22850876. ^ Allen, Mark (12 March 2007). "Missionary encounters extremely bizarre skin condition in Eastern Europe". Beware of the Blog. WFMU. Retrieved 6 August 2009. ^ "The man who looks like a tree". Metro. 22 November 2007. Retrieved 6 August 2009. ^ "Half Man Half Tree". Discovery Channel. Archived from the original on 1 September 2008. Retrieved 6 August 2009. ^ ""Tree Man" Medical Mystery". ABC News. 15 August 2008. Retrieved 19 December 2012. ^ a b Reuters (28 August 2008). "Indonesia's 'tree man' comes home after treatment". Los Angeles Times. Retrieved 6 August 2009. ^ Nathalia, Telly; Reuters (20 December 2008). "'Tree man's' warts growing again". The Australian. Retrieved 6 August 2009. ^ Sabtu (30 January 2016). "Dede Koswara Embuskan Nafas Terakhir, Ini Penyebab Kematian 'Manusia Akar' Bandung". Tribun Regional. Retrieved 1 February 2016. ^ "Rare disease: DMCH to form medical board tomorrow". The Daily Star. 2016-01-30. Retrieved 2016-01-30. ^ "বিরল এই বৃক্ষ মানব রোগ হয়েছে বাংলাদেশে একজনেরই - BBC বাংলা". BBC বাংলা (in Bengali). BBC. Retrieved 2016-01-30. ^ Bangladesh's 'Tree Man' to undergo surgery, The Guardian, 31 January 2016. ^ "Now I am well, says Bangladeshi Tree Man". Retrieved 2016-07-11. 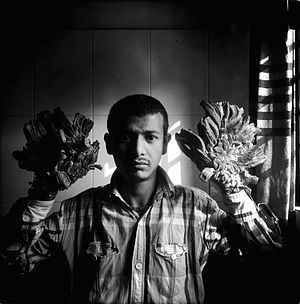 ^ "Hope for Bangladesh 'Tree Man' after 16 surgeries to remove growths". Al Arabiya. AFP. 10 January 2017. ^ "'Big mistake for me to leave': Man's 'tree man' condition returns worse than before after interrupting treatments". ^ "Bangladeshi girl may be first female with 'tree man syndrome'". BBC News. 2017-01-31. Retrieved 2017-02-02. ^ "Israeli doctors successfully operate on Gaza 'tree man'". Times of Israel. 2017-08-30. Retrieved 2017-08-30. ^ "Extraño caso de "niña árbol" en Honduras". La Tribuna. October 23, 2018. Yabe Y, Sadakane H (September 1975). "The virus of epidermodysplasia verruciformis: electron microscopic and fluorescent antibody studies". The Journal of Investigative Dermatology. 65 (3): 324–30. doi:10.1111/1523-1747.ep12598388. PMID 808576. Lewandowsky F, Lutz W (October 1922). "Ein Fall einer bisher nicht beschriebenen Hauterkrankung (Epidermodysplasia verruciformis)". Archiv für Dermatologie und Syphilis (in German). 141 (2): 193–203. doi:10.1007/BF01938833. This page was last edited on 11 February 2019, at 18:05 (UTC).